The farm in Western Wisconsin where I grew up on was on a high, dry ridge somewhere around 1,000 feet above sea level, and no natural water features to speak of. Our water well was several hundred feet deep, and when I was growing up, we drew water out of the ground with a pump jack that was originally powered by a windmill, and later replaced with a simple electric motor. The pump Jack lifted water about two cups at a time every four seconds. I mention all this to suggest why water preoccupied much of my childhood gardening experience. When we first arrived at our farm, the land around the buildings was rocky and sloped with no obvious place to put a garden. My mother, insisting that much of our food came from what we could grow, experimented with gardens in several places around the small collection of buildings we called home. I remember one spot in particular was flat, fertile, and far away from any water source. We spent the summer carrying half-full five-gallon buckets of water to thirsty plants during particularly dry weeks. A gallon of water weighs 8.5 pounds, each bucket was half-full to prevent spillage, and I carried two buckets to keep me balanced. Do the math and you can see I was carrying about 42 pounds of water, and at 10 years old, that's about how much I weighed. So it should come as no surprise to you that moving without carrying it is a fairly big deal for me. Over time, two things happened that made gardening easier. My dad installed underground piping to various parts of the farm to make moving water (for gardens and animals) easier, and we moved the garden closer to the house and a source of water was just a hose distance away. In the city, I of course have ready access to unlimited amounts of water from a spigot sticking out the side of my house. We do ultimately pay for water (not enough if you ask me), and a lot of work has gone into sourcing, purifying and transporting the water to my house, so I think I should drink it and not put it on my plants. For several years I have admired the concept of rain barrels for the obvious reasons. It's free water (after buying and installing the barrels), and keeps that much water out of our storm sewer system which dumps into one of our lakes, carrying anything it collected along with it. We have a significant lake algae problem here in Madison, so rain barrels save water use and help keep our lakes healthy. During a visit to my friend Erin and Jeff's house, I noticed they had a rain barrel disconnected from their downspout. 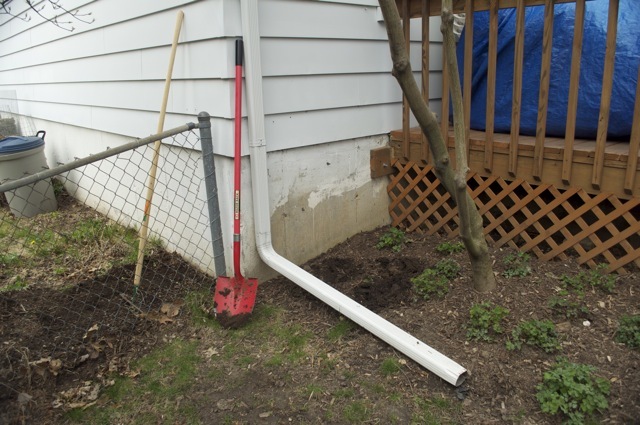 They admitted that after having gutters installed, they didn't have the heart to cut into the new downspout to install the rain barrel. When I went pie-eyed, they offered it to me -- I eagerly accepted. Future home of the barrel from Erin and Jeff. This will water the herb garden at left; the nearest water spigot is on the other side of the driveway. I also decided to buy two more rain barrels from the city of Madison during their annual sale. At $55 each, they city was giving a great deal compared to buying them commercially. Getting the barrels was a bit of an adventure. I knew the sale started at nine, and people advised me to get there early to be sure to get a barrel before they ran out. The city was selling barrels in two locations and we went to the closer of the two. The best laid plans... we got there at 10 to find they only had compost bins left. We drove across town to the other location, only to discover that they had barrels lined up for sale, and a line much longer than that of people waiting to buy one. We chatted with people at the back of the line, who informed us that someone from the city had announced that they would run out of rain barrels by the time we got to the front. Furious with myself for not following my original plan, we walked out and past the well-marked vehicle that belonged to one of Jay's cousins. We call her, and she told us her husband was standing in line somewhere in front of us. We called him and he flagged us down -- and he informed us that he was also behind the point at which they said there would be no rain barrels. He was still going to wait for a compost bin and we left. Future home of two rain barrels, back of house; this will water bed at side of garage. 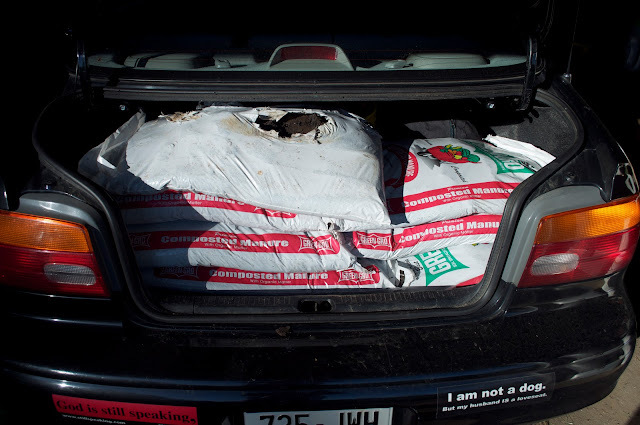 Not to be deterred, we decided we go to Johannsens’s greenhouse, support a local business and buy two barrels anyway. Their barrels were cheaper than from the city, but after adding all the equipment that was required they ended up twice as much as to what two barrels from the city would have been. We decided to buy them anyway, and while we were in the checkout line, at the very moment that I signed the credit card receipt, Jay's cousin called to say he had secured two rain barrels for us. I was simultaneously delighted with the news and mortified that I was going to have to return these barrels to the greenhouse. Kudos to the greenhouse, they immediately return them for me and we walked out with two plants instead of two rain barrels. We retrieve the barrels from Jay's cousin, and I'll write and show pictures in another post of how I installed them. I'd like to introduce you to one of the newest community gardens in Madison. Throughout this past winter, a small group of employees at the Madison, Wisconsin-based American Family Insurance got together to talk about their vision to turn some of the land surrounding the company's national headquarters into a community and a garden. Two company employees, Angela and LeeAnn, spearheaded the community garden idea as part of their capstone project for a Master certificate in sustainability from Edgewood College. They had done their research (there are many community gardens in the city) and were now applying what they learned not only about putting seeds in dirt but the many opportunities provided by a community garden. But by the time I learned about the project a few weeks ago, they were well on their way to turning the project over to the employees who would garden in it. I work at American Family, and during the last two to three years, the company has been working steadily on becoming more sustainable based on the triple bottom line of being good stewards of people, the planet AND profit. I never thought I'd hear the words "social justice" and helping resolve the "food desert" coming from company management, but here were two people talking about improving the health and wellness of employees, planting extra rows of veggies for food pantries and getting back to the company's roots when it was called "Farmer's Mutual" when the company started in 1927. 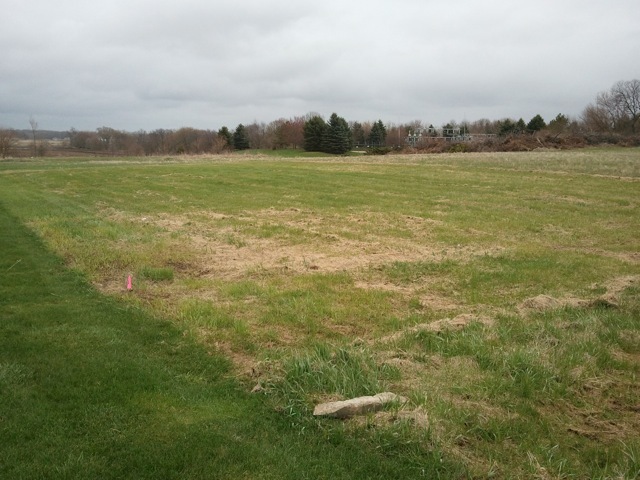 In late April the site was measured and marked, and the grass was cut very short. For 20 years this land has been allowed to grow grasses and not fertilized or chemically treated. 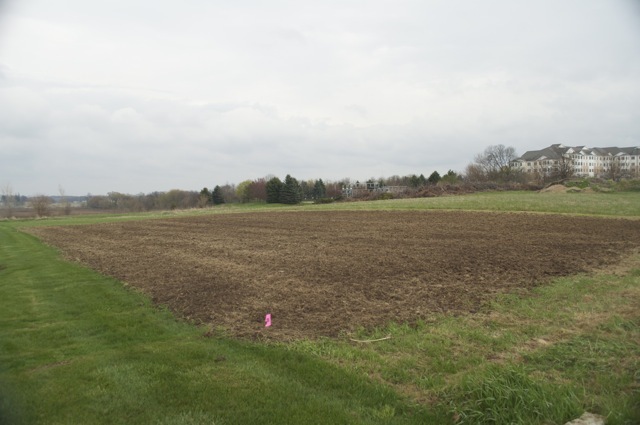 Earlier this spring, all the employees in Madison received an e-mail describing the project, the opportunity to garden near work, and an invitation to apply for one of the 56 plots. A few days later, American family held an Earth Day awareness fair over the lunch hour. The city of Madison sanitation department demonstrated rain barrels and compost bins. That's when I determined I absolutely had to have a couple rain barrels at our house. A birding group showed a live feed of the nesting eagles in Decorah, Iowa, and described the kind of birds that one could see around the national headquarters, which has a vast prairie habitat. Our food vendor, Sodexo, gave away coffee grounds from the cafeteria and the on-site coffee shop, and offered to collect coffee grounds for any gardeners who wished to enrich the soil with it. And finally, I had a lengthy conversation with Angela. She was super-enthusiastic too about not only encouraging employees to plant their own food, but she wanted to build a community of people around the garden idea that extended beyond spring planting and fall harvest. This is exactly the kind of community I want to be involved with, and I really want it to succeed. In early May the site was tilled for the first time, and oats were planted to add "green manure" and crowd out the weeds. Having already realized the limitations at my own home (a shaded backyard and not sure how much front yard I want to commit to vegetables) I applied for one of the 10 x 10 plots. I had already started this blog when I applied for one of the plots and this seemed like a great opportunity to write about my own misadventures in community gardening. When a second e-mail came across my desk inviting people to apply for one of the many positions on the new Garden Committee, I immediately asked to be one of the plot monitors. I figured it was the best way for me to see what was going on in the garden, providing me with ample inspiration for future blog posts. A few days later, I received an e-mail with a map and my assigned plot, number 26. One of the very exciting things is more than 70 people applied for plots, and while I'm sorry some people did not get a plot, I am encouraged by the number of people interested in gardening and being part of this community. Today (May 25) was our first community gardener meeting. Angela informed us that they were already thinking about expanding the garden next year. However, at this time the community garden is a pilot (American Family pilots everything before committing to something permanent, but when we commit, we COMMIT), so there is no certainty beyond this autumn's harvest. And hell, not even that's a certainty, who knows what kind of critters or disease lay in the fields on Madison's far east side, the kind of summer we'll have, etc.? So what am I going to plant? I have about a half dozen drawings that I've been playing with for both design and content. I started with a Mother's Day conversation with my mom, leaning on her 35+ years of gardening. "What would be the easiest thing to grow?" My thought was that I would not pay daily attention to this garden and I wanted something that would be both low-maintenance and difficult to kill. We decided that a nice crop of potatoes would be a good first start: unlike zucchini or beans, potatoes really can't get too big if harvest is delayed. After attending a couple of short classes given by Community GroundWorks, the nonprofit arm of Troy Gardens, I've learned that community gardens are one of the worst places to grow potatoes because everyone is growing potatoes and the flea beetles know it. I've been advised that if I don't want to spend my days picking off flea beetles, because after all this is an organic garden and pesticides are not allowed, I would be wise to pick a different crop. At today's Community Gardener meeting, we learned that we will be able to get into our plots around June 4. I was hoping to get into the garden on June 3 because I have that day off, but I may have to wait until the weekend. I will write more as I decide what to plant, how I plant it, and there will be many stories about Madison's newest community garden. 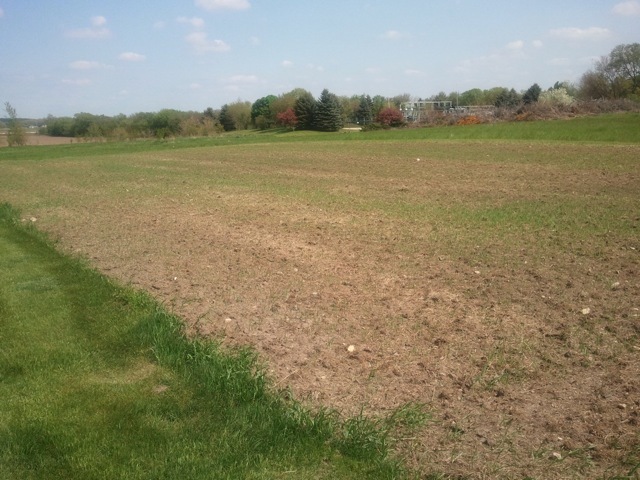 On May 20 the oats "green manure" cover crop can just be seen. The site will be tilled a second time to turn the oats over, and will be tilled a third time just before laying out the 10x10 plots. Amidst wedding planning, our house was for sale in spring 2010, and Jay and I did quite a lot of spring yard work. 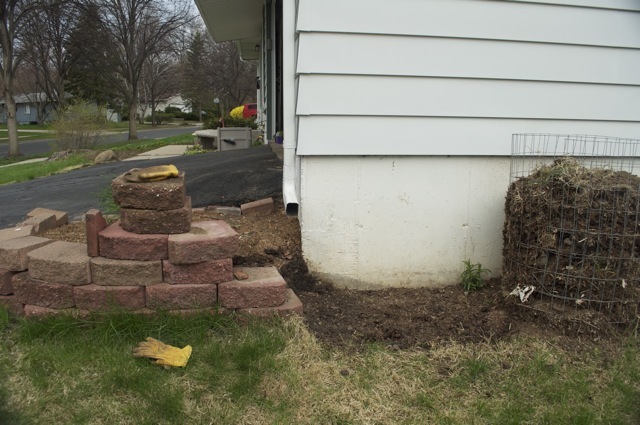 This mostly involved splitting hostas and moving lots, and lots, and lots of mulch. Either the hostas came up fast and the rabbits didn't have a chance to eat them, or our constant yard activity kept them away, but either way, I don't recall being frustrated with gnawed off hosta shoots. This year, however, something came together that attracted every floppy-eared rabbit in the neighborhood to our yard for a nightly buffet at our hosta salad bowl. I went out on one of the first spring afternoons to discover where torpedo shoots had been, now hosta stumps with nothing but a ground-level stalk of concentric circles remained. Memories of my trip to Farm and Fleet, the rat traps and my successful varmnit termination program entered my mind. Jay was inside, probably getting hungry for dinner, but I had rabbits to rid. I found the box where we had stored the traps from my move, quickly found five stakes and went into the back yard. One of my neighbors told me that the rabbits were living under our deck, and indeed, there were several holes in the lattice where a rabbit could easily squeeze through. I planted a stake and set an trap at each hole, and put two in one of the favored hosta beds. Because I wasn't particularly interested in repeating my earlier burial practice, I also sprayed the incredibly smelly "Liquid Fence" under the deck and on the hostas. I figured if the rabbits were stupid enough to ignore that, they practically deserved to fall upon the the springs of my unbaited traps. I returned to the kitchen where Jay, eyeing me up and down (dirty knees, screw gun in one hand and a sheepish look), asked me what I had been up to. "You don't want to know, so best not to ask," I replied. "Does it have anything to do with rabbits?" he inquired. "Ignorance is bliss," I replied. "If the neighbors ask, it's best you honestly don't know a thing." He quickly figured out what I had done, grimacing, I imagine, at his own memory of my creature killing spree from a few years ago. I checked the traps over the course of several days. One day, one of the unsprung traps had clearly been pushed (or pulled?) out from under the deck. Another day, the same thing occurred at the site of another trap. These rabbits were smarter than me. They also continued to eat hostas like their personal garden of organic mixed greens. While walking in the back yard one evening around dusk, I saw three fat rabbits just about to crawl through a fairly large opening in the corner of our fence. In hindsight, perhaps all of this could have been prevented with some fence mending? I pulled up all the stakes and set the traps at the opening. 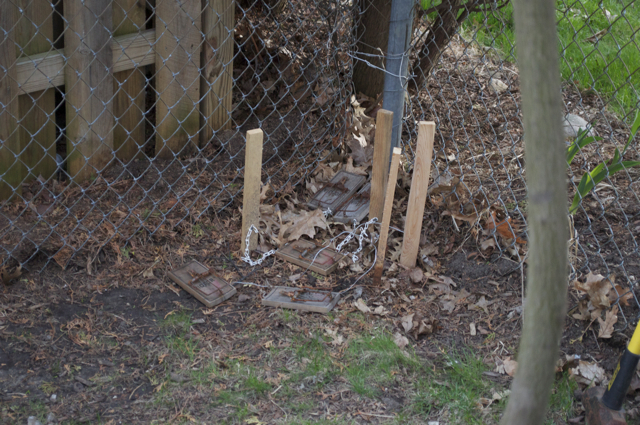 Five rat traps set at the corner opening in our fence. These were large rabbits, and my plan was to catch a rabbit (head, foot or tail) in one or more traps, and then go out there and finish the job myself. For this to succeed (success measured by very short suffering time and neighbors none the wiser) I had to keep an eye on the traps pretty consistently. This was not something to be left overnight. I set out a pair of leather gloves (with neck wringing in mind) and went into the house to prepare dinner. Every 15 minutes I stepped out to check the traps. The first time I frightened the three rabbits again, they had been gathering at the opening, probably surveying the new landscape. The second, third and fourth times there were no bunnies to be seen, either outside the fence or in my traps. By 8:30 p.m. Jay and I had finished dinner and I went out for the last time. In my heart I could not leave the traps set for an animal to happen upon and suffer through the night. I may have been raised with a practical country attitude about such things, but I was also raised to be kind to animals - and avoiding needless suffering was part of that upbringing. So I pulled up all the stakes and threw them in a pile in the garage. And then I sprayed the corner opening, all the hostas and all around the perimeter of the yard with Liquid Fence. Now that the hostas are up, they don't seem to be as tender or tasty to the rabbits, or maybe I'm just not noticing the nibble among the leafy proliferation. I know the rabbits are still around, and I know that they are breeding like, well, rabbits. So they still have to go, but these traps are no match for adult rabbits. My friend Tom is going to lend me a live trap. I may or may not write about it. Then next day, another tomato was coming into redness, just one more day and it would be perfect, picked off the vine and eaten right there among the plants. But by the cover of darkness, another creature of the night plucked it down, took a bite and threw it to the ground. Another spoiled vegetable with just a bit out of it. This went on for a week, and farmer Josh was turning red himself. So I went to Farm & Fleet, certain to find a varmnit solution. I walked up and down the sporting good aisle where I had my eye on a small pellet gun revolver. But after assessing the associated noise and living in close quarters with nature loving East siders, I decided I needed a stealthier way to get rid of the vegetable raiders. Poison was out, who knows what would be attracted to it? Live trap was no good, what was I going to do, drive whatever I caught to Monona and drop it off in someone else's garden? Somewhere the idea of using a rat trap came to mind. Big, effective, concealable among the vegetables. I bought five. I went home and set one up inside a tomato cage so I wouldn't accidentally trap a cat, dog or a bird. I put a screw through the wooden trap platform and tied a wire to the screw, and then tied it to a stake driven deep into the ground. I got this idea thanks to my brother who once set mouse traps just inside a chase between floors, and then lived for a week with the sound of a mouse dragging the trap to places my brother could never get to. The last thing I needed was an animal crawling off to one of my neighbors and pointing in my general direction. It was mid-day on the weekend, so I started to mow the lawn. I checked the trap 15 minutes later, just to see it. My eyes did what a vole's can't, they opened wide to find a freshly dead vole among the tomatoes. I pried open the trap, released the body and reset the trap, humming success to myself, but not sure what I'd do with the body. I put it in a grocery bag in my garage and went back to mowing. Fifteen minutes later I checked, and found a chipmunk just short of a ripe tomato. I reset the trap and was feeling pretty good about my plan. Fifteen minutes later I found one of the chipmunk's relatives. Fifteen minutes later, a rabbit. Fifteen minutes later, another rabbit. As the bodies piled up I realized I hadn't thought through to disposal. On the farm, we simply threw dead animals into the field "for the coyotes," or whatever ate dead animals over night, because they were always gone the next day. In the city however, I needed a more discreet disposal method. The garbage wouldn't be picked up for six days. The storm sewer crossed my mind, but I like the lakes too much to do that. I decided to bury them but it was getting late, so I left them in the bag just outside the garage. It rained for several days so I couldn't dig the hole to bury the evidence. When the rain stopped, I went to the far end of my yard, moved the mulch aside from a small tree and dug a hole. While I was doing this I was on the phone talking with my then boyfriend, now husband, Jay. I went over to pick up the body bag and gagged. It reeked of death and the contents were animated. Now, the five animals had not zombified, but they may as well have. Flies had found a perfect home for their newborn, and the bag was alive with maggots. I gingerly picked up one handle of the grocery bag, gagging from the smell, and quickly carried it to the back of the yard, spilling the smaller and animated inhabitants along the way. I got to the hole and poured the gelatinized contents into the hole and quickly covered up the evidence. Jay's version goes like this, "NEVER EVER CALL ME WHEN MOVING DEAD ANIMALS AGAIN." Apparently his sympathetic responses reacted from afar and he was gagging on the other end of the phone. The good news is I had no more damage that year and put the traps away. Three years later, I have a rabbit problem here on the West side. And I still have the rat traps. And I haven't gotten rid of the rabbits yet. Stay tuned. Jay and I have a nice front, back and one side yard. The other side yard is more of a drainage system for our upland neighbors. The back yard is positively shady and no good for anything but grass, dandelions and creeping charlie. Last summer our front yard featured a large tree protecting a shady, neatly mulched hosta bed with some tidy shade-loving flowering annuals. That is until a July wind storm blew the tree onto the house a week before our wedding (see video) and our shady front was suddenly hot and dry with withering annuals and hostas shirking back into the mulch. We gave up on the bed after the tree removal people and the roofers trampled all but the sturdiest plants. But spring is here and we have to face the season, "What to do with the mulch bed and hostas that just aren't going to take all that sun without daily watering?" Jay didn't want to replant it with grass and I agreed with him. He also has a fundamental dislike of annual flowering plants which I don't agree with. One thing was clear, we had to do something. One day Jay suggested planting vegetables there. Except for our eastern side yard, the front gets the most sun. I dismissed it as not having much curb appeal, feeding my ongoing desire to sell this house and move east. But as the days got longer and there was no sign of us getting the house ready to sell, the idea of a front yard vegetable garden began to take root. Before you knew it, I had visions of zucchini, gourds and other sprawling plants fanning across the mulched soil, soaking up the sun and looking beautiful. Well, it would look beautiful to Madison's East siders, this idea could get us kicked off the block here on the West side. But frankly, they haven't complained about the pink flamingos, plastic palm trees at Christmas or my three compost bins, so what's a few vegetable plants in the front yard? So a week ago, Jay and I dug out all the perennial plants we could identify, and a few we couldn't, split the hostas and gave them new homes in the back yard. (The transplanted hostas have since become veritable salad bowl for the rabbits who are saying "A new pleasure,*" read more if you care). I have ornamental gourds, yellow squash and zucchini under grow lights in the basement and I'm anxiously awaiting 50 degree nights to transplant them into the dirt. I encourage you to follow my blog. Use the Follow with Google Friend Connect at left if you have a Google (gmail), Twitter, Yahoo, AIM, NetLog or OpenID account. At the bottom, you are welcome to comment as well using your Google, LiveJournal, WordPress, TypePad, AIM or OpenID account. *To the non-Douglas Adams fans among you, this will sound nonsensical, but I can imagine the rabbits like one of the creatures at the Perpetual Floating Party that Arthur, Ford, and Slartibartfast go to in the Hitchhiker's books, who grab Arthur's cherished bottle of retsina and run off chanting, "A new pleasure, a new pleasure!" Bunny rabbits are cute. In the spring, they (improbably) lay chocolate eggs and children expect the Easter Bunny to deliver overnight candy in time for Easter morning. Springtime is often when naive parents think that a pet rabbit is a good idea. My earliest memory of rabbits is the one many of us grew up with -- Bugs Bunny relentlessly teasing Daffy Duck, getting the best of Porky Pig and always getting away from Elmer Fudd. It's this last character, however, that I most identify with today. Perhaps it's because I went to see the Madison Opera's awesome La Traviata. Or maybe because I listened to classical music while gardening this weekend. But most likely it's because I identify with Elmer singing "Kill the wabbit" in the Loony Tunes condensed version of Wagner's Ring of Niebelungen. Over the last few weeks, while you've been admiring the daffodils, tulips and early tree buds, the local rabbit population bought the all you can eat pass to the salad bar known as my hosta beds. Nibble here and nibble there has left green stumps where, in other people's yards, there would be torpedo shaped stalks or even the early unfurling of bright spring green leaves. No, I'm not taking this personally and surely the rabbits are also eating through my neighbor's yards, but seriously, the grass is green, go eat some of that. And so, the country boy started to figure out what to do about the four-legged, floppy eared and voracious problem known as city rabbits. Solutions abound, I'll share some of my favorites, succeses and failures (both happened at the same time a few years ago) and the state of the hosta beds in the next entry.